The WebReserv system now has two ways for your bed & breakfast, vacation rental, or campground to set up a weekend stay rule. If you require at least a 2 night minimum over a weekend, then you can now select between “Reservation Must Be At Least” or “Weekend Stay Required“. The difference between them is important, and we will explain each option below. In the system to define a weekend restriction rule, you will first want to set your Weekend definitions. 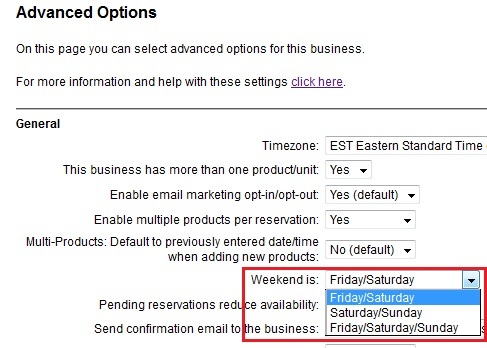 The system defaults to a weekend being Friday/Saturday, but it can be adjusted by going to Setup – Business Information – Advanced Options. This entry was posted in Bed and Breakfasts, General, New Features, Rate Calculation and tagged bed and breakfast booking system, campground booking system, Setup weekend stay, vacation rental booking system, WebReserv week end stay rule, weekend stay rule. See how the WebReserv booking system can be used for campgrounds. Try it out for yourself, it’s just a demo setup. This entry was posted in Online Demos and tagged booking engine campground, booking system camping, campground booking system, demo booking system campground, webreserv demo.